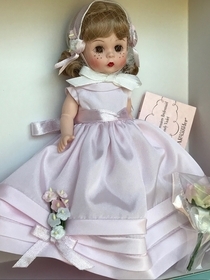 "Bridesmaid Wendy Violet" has brown eyes, a sprinkling of freckles and her Tosca colored hair styled in a flip with bangs. 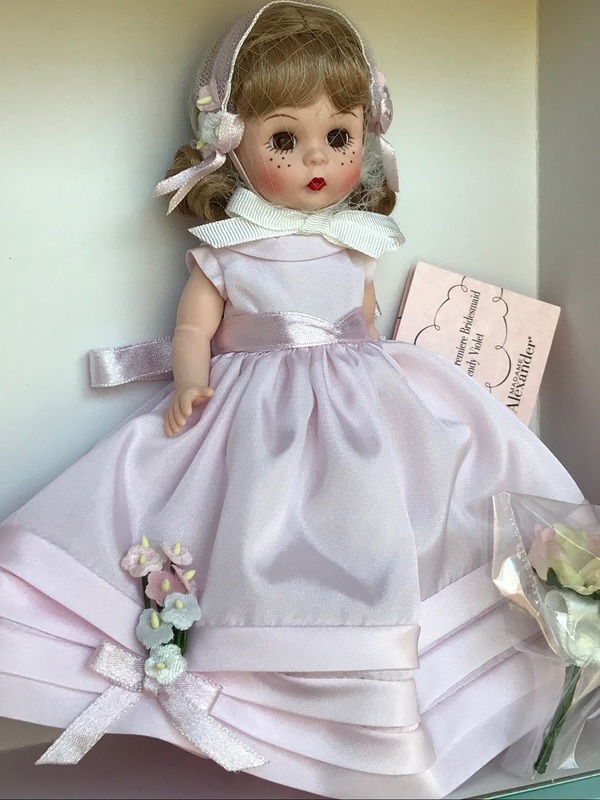 Her taffeta gown is a delicate shade of violet with a triple row of tucks around the bottom of the skirt which is accented with pink and white flowers and a bow matching he waistband. Her outfit also includes a full-length multi-layered petticoat with each layers banded in pale violet satin; irridescent sheer pantyhose; satin slippers and a delicate chiffon headpiece trimmed with tiny flowers and bows. Her bouquets includes three large pale yellow peonies edged in pale pink tied with a satin ribbon. Her COA shows her to be LE49/110. She was photographed with her hairnet still and has never been removed from her box.